Of the many sights I’ve become accustomed to seeing all over Paris, few warm my heart as much as this one: the ubiquitous public toilette. These things are all over the place (especially in the vicinity of Métro stops and tourist attractions), and I’ve frequently made use of them. Previously, they were all coin-operated, so most of them still have coin slots, but now they’re all free (as noted by the sign on top that says Accès gratuit, free access). These are quite similar in design to the (few) public toilets scattered around San Francisco (some of which are free, and others not). You push the button and the door slides open; it closes automatically when you’re inside. After you’ve made your deposit, you stick your hands in an opening where (non-potable) water rinses them, if the sink happens to be working. (Soap and a hand dryer appear occasionally but work even less frequently.) Then you turn the door handle; the door opens to let you out and closes again. After each use, the facility goes through an automatic “wash-sanitize-dry” cycle, which includes flushing the toilet. During this time, the sign next to the door will say Occupé (occupied). When the sign goes back to Libre (free), the next person can press the button and enter. Now, to clear up any potential misconceptions: these are not the most spotless restrooms in the world. Despite the alleged automatic cleaning, the floors in particular are often gross, there’s sometimes a smell, and the seat is always—always—wet (with, one hopes, water or some sanitizing agent—so much for the automatic drying). 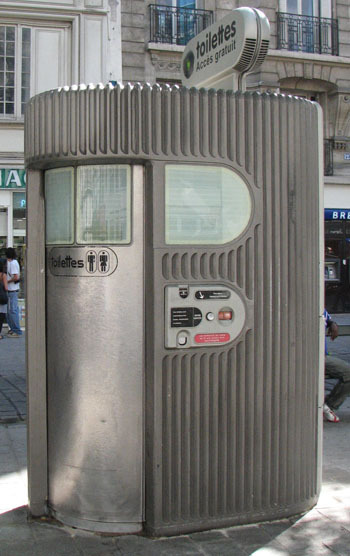 But, given the shortage of other publicly available restrooms in the city and the fact that not only dogs but men have traditionally made use of building walls as pissoirs, these little auto-toilets are most welcome. There are a few curiosities, though, which seem to perplex even the locals. For one thing, the toilettes are typically closed at night from 10 p.m. to 6 a.m., and based on my informal observations, they’d probably get maximum usage between the hours of 10 and 1 (at least in the more touristy areas) if they were open then. Also, they sometimes go out of service (hors service) for no apparent reason, but usually you can’t tell if the Occupé sign means that it’s really occupied, that it’s closed for the night, or that it’s simply randomly not working. (Different units have different indicators, so depending on which one you’re looking at, you may be able to get more or less information.) Numerous times I’ve seen someone press the “Open” button repeatedly during the cleaning cycle, convinced that since there was clearly no one inside, the machine was simply stuck and should let them in. Oh, and when the cleaning cycle is finished and the sign changes back to Libre, if you press the button right away, nothing happens. You have to wait about 5 seconds. These units could really use a few small user interface tweaks, but that aside, they make life here distinctly more civilized. Beautiful and efficient as the pissoire seems to be, it’s hard to tell if it is woman-friendly. What thinks Morgen? It certainly beats spending extra money on another espresso for a non-furtive entre to the toilette of a nearby cafÃ©. Or, to get extra “dry” milage, it beats avoiding anything that’s remotely diuretic for the day. Makes me wonder when these marvels are comeing to the tennis courts of Riverside Park in the Big Apple (NYC, USA), yes, with an even improved interface.